Hi. 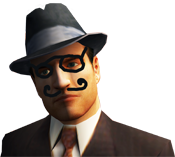 I am starting with modding mafia. My first problem is Zmodeller 1.07b. I like Sketchup but its very dificult import 3ds from sketchup to zmodeler. I was trying export 3ds from sketch, import to zmodeller2 and than import to zmodeler1, but from 10 tries was succesful just one. I don't know whitch setting for export 3ds is right. And I have question abou scale i have drawn model in scale 1:1 but it was too big for zmodeler. I have not seen the model i 3d window or in second way was invisible (same color like wallpaper). Thaks for answers. Sorry for my english i am czech. Hi there and welcome to Mafiascene! 1. Make sure that all faces are alligned into the right direction. The untextured model must be completely white, no visible blue bits allowed as these indicate backfaces which aren't rendered in Zmod or Mafia. 2. Make sure you only apply one texture to each object. Any objects that have multiple textures applied to them may be imported improperly. Zmodeler will usually then discard any other material than the first. Using components can fix this. This step is based on my experiences of eight years ago, maybe it doesn't apply anymore so trial and error is advised. 3. Make sure you are not exporting SU's edges. These are completely useless and only clutter the model. Again it may require some trial and error to get things to work properly. There's also a chance that you may need to reload any textures onto each material after importing your model into Zmod. It can take some time before you have figured out the best workflow. As for scale, I usually import a model from Mafia into my 3D tool, which is in your case SU. You can use this for measuring. Beware, Mafia uses a very small scale. 1 meter usually equals 1 centimeter in 3D software. In such cases I'd recommend to rescale your 3D model after completion inside SU before exporting it to Zmodeler. Once imported in Zmod, re-import your reference model from Mafia a second time to see if it matches up with the one that got exported with your model from SU. If it does, you can remove it and remember that scale for your next model. If it doesn't, you'll have to scale your model accordingly afterwards inside of Zmod.